I would to thank you for this pretty little thing I received yesterday in my mailbox. The packaging itself is a work of art. All this pretty little pieces perfectly arranged, it's a real shame to have to assemble them ! Pieces was machined with high accuracy, instruction manual on CD has the same quality. I wait for a long time before passing through and satisfy my curiosity. Just in one word, very well done Kontax ! As a physics teacher with an interest in gadgetry I ordered my KS80 after a cursory glance around some Stirling Engine websites. The KS80 seemed good value for money, but it wasn't until I received the kit that I realised what a gem this is. The engine parts have clearly been manufactured with great precision and care, to an excellent design. The assembly instructions were meticulous, and a foam "jig" was supplied to aid with assembly - very thoughtful. In 45 minutes I had a beautiful engine which worked perfectly first time. My KS80 will run happily off the heat from the palm of my hand, or even perched on a leg. As I write it has been running all day at about 120rpm off the wasted heat from my laptop charger. If you are tempted, buy it - I'm sure any scientist, engineer or gadgeteer will be delighted to own one. What a superb piece of precision engineering! A wonderful example of craftsmanship and design to produce laboratory-quality engines at a ridiculously cheap price. It has been sitting on my modem and running continuously now for 7 months, amazing both my family and friends. I have colleagues who now drop into the office - just to have a look - and go away amazed and baffled. Very well done Stirling. 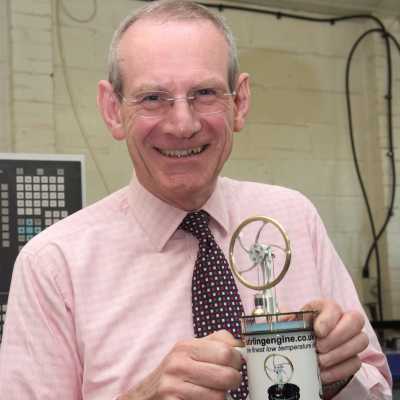 Early in 2007 we were visited by the President of the Institution of Mechanical Engineers (IMechE), Mr John Baxter. He was very pleased and impressed to find out that such a beautiful and precise Stirling engine was being manufactured by us here in England. Mr Baxter was so pleased with our engine that he decided to feature it in his series of lectures given all around the world to senior figures in the alternative and clean energy industry. ImechE have taken 80 of our engines for Mr Baxter to give as gifts to dignitaries as an example of the quality of engineering and manufacturing still being done in England. A large number of schools and universities all around the world have bought our engines for educational use, the transparent chamber and cylinder make it very easy to explain the Stirling cycle to students. Our KS90 engine is endorsed and approved by the Glasgow Science Museum in Scotland, where they will be displaying it alongside the original 1800's engine designed and built by the Rev. Robert Stirling. The KS90 kit which I bought from Kontax several months ago has provided much joy here. The kit assembled like the proverbial Swiss watch, albeit much more simply! All the hard work has been done by the makers. The assembly was simply a pleasure, and provided me with a more intimate understanding of the construction and operation of these amazing bits of precision engineering. The engine is absolutely as sensitive as promised. It has run now for many hours from various power sources, including chemical hand warmer packets. Happen to have a stainless steel "brick" found in the bits bucket of my hobby shop; a slab of that metal the size of a common brick (but heavier, of course). If I warm that brick in hot water, it absorbs enough heat to run the model for a few hours to come; offering a convenient and portable source of energy. The kit includes a CD-ROM of amazingly clear photographs of the simple stages of the kit's assembly. The presentation of text and pictures of that disk are of the same sterling quality as the KS90. Summary: Entirely satisfactory in every detail, this kit, this engine, this firm's productions and presentation and customer services. After placing an order with Kontax for the KS-90 Hand Held kit (Black), a small package arrived the next day. Upon opening the sealed package it was apparent straight away of the quality, each individual meticulously engineered part was placed into a dense foam sandwich which had been machined out to give an exact tight fit to ensure that no damage to the very delicate parts would occur. The kit came with a very concise instruction manuel on a CD which could be printed off for convenience, the actual CD manuel on screen was very clear with large highly detailed photographs. All parts of the kit fitted together perfectly and each piece was machined with incredible accuracy, the kit from start to finish took about 1.5 hours to complete. The engine was placed on a hot cup of tea and with a little turn of the flywheel began to work approaching what must have been about 100 RPM and made a great "very quiet" sound. I have made a number of Stirling engines in the past both low and high temperature types but never of the quality associated with this kit, I would stongly recommend this to anybody interested in Sterling engines or to those who just like constructing things. It may sound as though I work for the company which I do not but credit should be given where credit is due. 10/10. This engine is a piece of precision engineering excellence. The kit went together faultlessly.Works really well. Well packed and next day delivery. Great value for money. Well done Kontax. Kontax choice of materials, components and design make the KS90 an aesthetically pleasing small object of desire which is also attractive to watch in operation. I particularly like the see-through cylinders, the rimmed flywheel, and the odd symmetry of the 5 curved spokes and 7 insulating pillars. The KS90 is remarkably free running. On my windowsill it runs for well over 3 hours on the heat retained after the sun has gone down. As it continues to turn reliably well below 25 revolutions per minute, slow motion becomes apparent as one of its charms. The attention to detail evident in manufacture is also given to the packaging and dispatch. This engine is truly a thing of beauty. It will indeed run on the heat from your hand, but for some real excitement put it on a cube of ice or a steaming cup of tea. Perhaps the most fun is pulling it out at a pub and watching the crowd gather around you to try and understand why and how it works! Over Christmas I order the KS90 kit, it arrived the next day!. Super fast service. The engine went together with no problems at all. I had it running on the heat of my hand, it will run with just a temperature difference of just 5 degrees centigrade. This engine is perfectly engineered and I just love it. Well done Kontax.